”A Black Heart In White Hell” is the brand new short film from restless indie horror director Dustin Mills and Crumpleshack Films. If you aren’t aware of Dustin’s work yet then you’re missing out on one of the most exciting and hard working independent filmmakers working today, whose body of work is of a consistent level of high quality and refreshingly original. ”A Black Heart In White Hell” sees Dustin in full experimental mode, dragging the viewer into hell with the films victim and – if you dare stick around – forcing us to endure her plight with her. ”Not Sorry” are the words The Woman (Reagan Root) writes on the mirror before she takes her own life in the bath tub, assuming that she’s leaving this world unpunished for crimes we later learn she committed. However – when she wakes up in a white room, a series of events unfold which force her to face the consequences of her sins. What ensues is a bloody nightmare involving monsters and tormenting imagery as she’s punished in some gross, unsettling ways. There were 2 movies which sprung to mind when watching ”A Black Heart In White Hell”: ”Eraserhead (1977)” and ”Begotten (1990)”. My comparison is not based on the content contained within either of those movies, as they’re both completely different; what I’m getting at is they both share an ability to evoke a strong visceral reaction and psychologically pummel your senses at the same time. 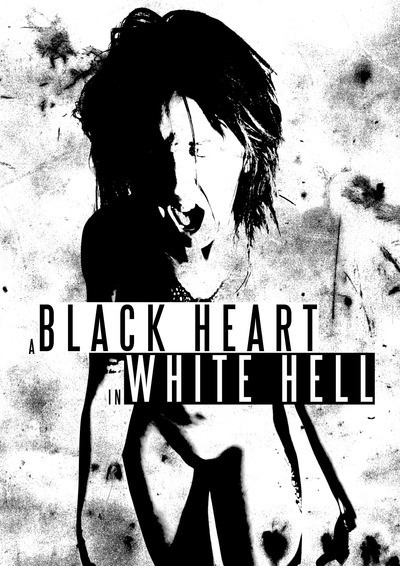 ”A Black Heart In White Hell”, like those 2 movies, unsettled me through imagery, sound and it’s own original content. I guess another comparison to those movies you could make is that it’s like nothing else out there, but that’s always been the case with Mills’ work anyway. However, Lynch and Merhige’s movies are ugly experiences which suffer from too much self-indulgence. ”A Black Heart In White Hell” is a visually stunning spectacle to look at, with an interesting story and additional fun factor. Sure, it’s gross and distressing, but it’s also highly enjoyable and oozing with immediate rewatch value. The film contains absolutely no dialogue, but the story is cohesive: The nightmares of the lead and her crimes appearing on a television screen give us all of the information we need to understand what’s going on and why she’s being punished. Credit must be given to Reagan Root for being able to portray a convincing character through actions, expression and body language alone. She’d still be a joy to watch even if she wasn’t always naked. The supporting cast consist of Dave Parker (with the awesome Youtube channel), Brandon Salkil and Jeremy Ryan, who serve as a reminder of why her soul is being ripped apart. ”A Black Heart In White Hell” is Mills’ best work to date and continues to showcase the evolution of a boundary pushing auteur making a name for himself in the world of underground cinema. You can pick this up along with Dustin’s other movies over at Dustin Mills Productions, or stream it on VOD for pocket change. Not only would you be supporting indie film by checking it out; you’d be treating yourself to some unique, original horror.